Ahmad, A., Del Bue, A., Lima, P.
This work deals with a background subtraction algorithm for a fish-eye lens camera having 3 degrees of freedom, 2 in translation and 1 in rotation. The core assumption in this algorithm is that the background is considered to be composed of a dominant static plane in the world frame. 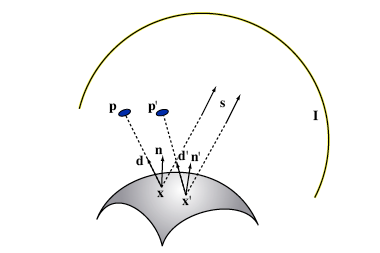 The novelty lies in developing a rank-constraint based background subtraction for equidistant projection model, a property of the fish-eye lens. A detail simulation result is presented to support the hypotheses explained in this paper. Pons-Moll, G., Crosas, C., Tadmor, G., MacLeod, R., Rosenhahn, B., Brooks, D.
Kim, S., Simeral, J. D., Hochberg, L. R., Donoghue, J. P., Black, M. J.
Lima, P., Santos, J., Estilita, J., Barbosa, M., Ahmad, A., Carreira, J. This paper describes the status of the ISocRob MSL roboticsoccer team as required by the RoboCup 2009 qualiﬁcation procedures.Since its previous participation in RoboCup, the ISocRob team has car-ried out signiﬁcant developments in various topics, the most relevantof which are presented here. These include self-localization, 3D objecttracking and cooperative object localization, motion control and rela-tional behaviors. A brief description of the hardware of the ISocRobrobots and of the software architecture adopted by the team is also in-cluded. Stehle, T., Wulff, J., Behrens, A., Gross, S., Aach, T.
Fluorescence endoscopy is an emerging technique for the detection of bladder cancer. A marker substance is brought into the patient's bladder which accumulates at cancer tissue. If a suitable narrow band light source is used for illumination, a red fluorescence of the marker substance is observable. Because of the low fluorescence photon count and because of the narrow band light source, only a small amount of light is detected by the camera's CCD sensor. This, in turn, leads to strong noise in the recorded video sequence. To overcome this problem, we apply a temporal recursive filter to the video sequence. The derivation of a filter function is presented, which leads to an optimal filter in the minimum mean square error sense. The algorithm is implemented as plug-in for the real-time capable clinical demonstrator platform RealTimeFrame and it is capable to process color videos with a resolution of 768times576 pixels at 50 frames per second. Roth, S., Black, M. J. 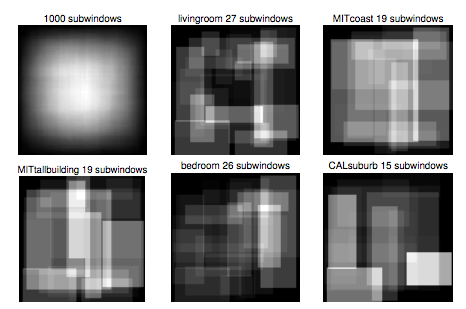 We develop a framework for learning generic, expressive image priors that capture the statistics of natural scenes and can be used for a variety of machine vision tasks. The approach provides a practical method for learning high-order Markov random field (MRF) models with potential functions that extend over large pixel neighborhoods. These clique potentials are modeled using the Product-of-Experts framework that uses non-linear functions of many linear filter responses. In contrast to previous MRF approaches all parameters, including the linear filters themselves, are learned from training data. We demonstrate the capabilities of this Field-of-Experts model with two example applications, image denoising and image inpainting, which are implemented using a simple, approximate inference scheme. While the model is trained on a generic image database and is not tuned toward a specific application, we obtain results that compete with specialized techniques. Stehle, T., Auer, R., Gross, S., Behrens, A., Wulff, J., Aach, T., Winograd, R., Trautwein, C., Tischendorf, J. The evolution of colon cancer starts with colon polyps. There are two different types of colon polyps, namely hyperplasias and adenomas. Hyperplasias are benign polyps which are known not to evolve into cancer and, therefore, do not need to be removed. By contrast, adenomas have a strong tendency to become malignant. Therefore, they have to be removed immediately via polypectomy. For this reason, a method to differentiate reliably adenomas from hyperplasias during a preventive medical endoscopy of the colon (colonoscopy) is highly desirable. A recent study has shown that it is possible to distinguish both types of polyps visually by means of their vascularization. Adenomas exhibit a large amount of blood vessel capillaries on their surface whereas hyperplasias show only few of them. In this paper, we show the feasibility of computer-based classification of colon polyps using vascularization features. 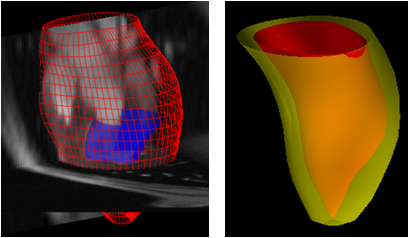 The proposed classification algorithm consists of several steps: For the critical part of vessel segmentation, we implemented and compared two segmentation algorithms. After a skeletonization of the detected blood vessel candidates, we used the results as seed points for the Fast Marching algorithm which is used to segment the whole vessel lumen. Subsequently, features are computed from this segmentation which are then used to classify the polyps. In leave-one-out tests on our polyp database (56 polyps), we achieve a correct classification rate of approximately 90%. Ulusoy, A., Calakli, F., Taubin, G.
In this paper we present a new one-shot method to reconstruct the shape of dynamic 3D objects and scenes based on active illumination. In common with other related prior-art methods, a static grid pattern is projected onto the scene, a video sequence of the illuminated scene is captured, a shape estimate is produced independently for each video frame, and the one-shot property is realized at the expense of space resolution. The main challenge in grid-based one-shot methods is to engineer the pattern and algorithms so that the correspondence between pattern grid points and their images can be established very fast and without uncertainty. We present an efficient one-shot method which exploits simple geometric constraints to solve the correspondence problem. We also introduce De Bruijn spaced grids, a novel grid pattern, and show with strong empirical data that the resulting scheme is much more robust compared to those based on uniform spaced grids. Kernel learning algorithms are currently becoming a standard tool in the area of machine learning and pattern recognition. In this chapter we review the fundamental theory of kernel learning. As the basic building block we introduce the kernel function, which provides an elegant and general way to compare possibly very complex objects. We then review the concept of a reproducing kernel Hilbert space and state the representer theorem. Finally we give an overview of the most prominent algorithms, which are support vector classification and regression, Gaussian Processes and kernel principal analysis. With multiple kernel learning and structured output prediction we also introduce some more recent advancements in the field. Guan, P., Weiss, A., Balan, A., Black, M. J.
Vargas-Irwin, C. E., Yadollahpour, P., Shakhnarovich, G., Black, M. J., Donoghue, J. P.
Wang, C., Gorce, M. D. L., Paragios, N.
Sinha, P., Balas, B., Ostrovsky, Y., Wulff, J.
Fritz, M., Black, M., Bradski, G., Karayev, S., Darrell, T.
Serre, T.*, Jhuang, H*., Garrote, E., Poggio, T., Steele, A.
Pons-Moll, G., Tadmor, G., MacLeod, R. S., Rosenhahn, B., Brooks, D. H.
We propose a new external force field for deformable models which can be conve- niently generalized to high dimensions. The external force field is based on hypothesized interactions between the relative geometries of the deformable model and image gradi- ents. The evolution of the deformable model is solved using the level set method. The dynamic interaction forces between the geometries can greatly improve the deformable model performance in acquiring complex geometries and highly concave boundaries, and in dealing with weak image edges. The new deformable model can handle arbi- trary cross-boundary initializations. Here, we show that the proposed method achieve significant improvements when compared against existing state-of-the-art techniques. Geometric remodeling of the left ventricle (LV) after myocardial infarction is associated with changes in myocardial wall stress. The objective of this study was to determine the regional curvatures and wall stress based on three-dimensional (3-D) reconstructions of the LV using MRI. Ten patients with ischemic dilated cardiomyopathy (IDCM) and 10 normal subjects underwent MRI scan. The IDCM patients also underwent delayed gadolinium-enhancement imaging to delineate the extent of myocardial infarct. Regional curvedness, local radii of curvature, and wall thickness were calculated. The percent curvedness change between end diastole and end systole was also calculated. In normal heart, a short- and long-axis two-dimensional analysis showed a 41 +/- 11% and 45 +/- 12% increase of the mean of peak systolic wall stress between basal and apical sections, respectively. However, 3-D analysis showed no significant difference in peak systolic wall stress from basal and apical sections (P = 0.298, ANOVA). LV shape differed between IDCM patients and normal subjects in several ways: LV shape was more spherical (sphericity index = 0.62 +/- 0.08 vs. 0.52 +/- 0.06, P < 0.05), curvedness at end diastole (mean for 16 segments = 0.034 +/- 0.0056 vs. 0.040 +/- 0.0071 mm(-1), P < 0.001) and end systole (mean for 16 segments = 0.037 +/- 0.0068 vs. 0.067 +/- 0.020 mm(-1), P < 0.001) was affected by infarction, and peak systolic wall stress was significantly increased at each segment in IDCM patients. The 3-D quantification of regional wall stress by cardiac MRI provides more precise evaluation of cardiac mechanics. Identification of regional curvedness and wall stresses helps delineate the mechanisms of LV remodeling in IDCM and may help guide therapeutic LV restoration. Gross, S., Kennel, M., Stehle, T., Wulff, J., Tischendorf, J., Trautwein, C., Aach, T.
Endoscopic screening of the colon (colonoscopy) is performed to prevent cancer and to support therapy. During intervention colon polyps are located, inspected and, if need be, removed by the investigator. We propose a segmentation algorithm as a part of an automatic polyp classification system for colonoscopic Narrow-Band images. Our approach includes multi-scale filtering for noise reduction, suppression of small blood vessels, and enhancement of major edges. Results of the subsequent edge detection are compared to a set of elliptic templates and evaluated. We validated our algorithm on our polyp database with images acquired during routine colonoscopic examinations. 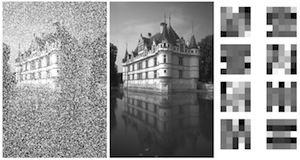 The presented results show the reliable segmentation performance of our method and its robustness to image variations. Tan, C., Jhuang, H., Singer, J., Serre, T., Sheinberg, D., Poggio, T.
Stanley, G., Black, M. J., Lewis, J., Desbordes, G., Jin, J., Alonso, J. It is believed that left ventricular (LV) regional shape is indicative of LV regional function, and cardiac pathologies are often associated with regional alterations in ventricular shape. 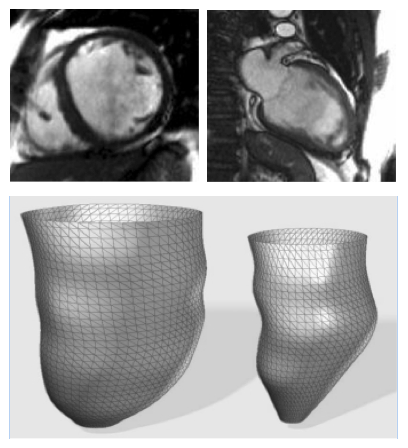 In this article, we present a set of procedures for evaluating regional LV surface shape from anatomically accurate models reconstructed from cardiac magnetic resonance (MR) images. LV surface curvatures are computed using local surface fitting method, which enables us to assess regional LV shape and its variation. Comparisons are made between normal and diseased hearts. It is illustrated that LV surface curvatures at different regions of the normal heart are higher than those of the diseased heart. Also, the normal heart experiences a larger change in regional curvedness during contraction than the diseased heart. It is believed that with a wide range of dataset being evaluated, this approach will provide a new and efficient way of quantifying LV regional function. Akhter, I., Sheikh, Y., Khan, S.
In factorization approaches to nonrigid structure from motion, the 3D shape of a deforming object is usually modeled as a linear combination of a small number of basis shapes. The original approach to simultaneously estimate the shape basis and nonrigid structure exploited orthonormality constraints for metric rectification. Recently, it has been asserted that structure recovery through orthonormality constraints alone is inherently ambiguous and cannot result in a unique solution. This assertion has been accepted as conventional wisdom and is the justification of many remedial heuristics in literature. Our key contribution is to prove that orthonormality constraints are in fact sufficient to recover the 3D structure from image observations alone. We characterize the true nature of the ambiguity in using orthonormality constraints for the shape basis and show that it has no impact on structure reconstruction. We conclude from our experimentation that the primary challenge in using shape basis for nonrigid structure from motion is the difficulty in the optimization problem rather than the ambiguity in orthonormality constraints. Stehle, T., Hennes, M., Gross, S., Behrens, A., Wulff, J., Aach, T.
Endoscopic images are strongly affected by lens distortion caused by the use of wide angle lenses. In case of endoscopy systems with exchangeable optics, e.g. in bladder endoscopy or sinus endoscopy, the camera sensor and the optics do not form a rigid system but they can be shifted and rotated with respect to each other during an examination. This flexibility has a major impact on the location of the distortion centre as it is moved along with the optics. In this paper, we describe an algorithm for the dynamic correction of lens distortion in cystoscopy which is based on a one time calibration. For the compensation, we combine a conventional static method for distortion correction with an algorithm to detect the position and the orientation of the elliptic field of view. This enables us to estimate the position of the distortion centre according to the relative movement of camera and optics. Therewith, a distortion correction for arbitrary rotation angles and shifts becomes possible without performing static calibrations for every possible combination of shifts and angles beforehand. Stanley, G. B., Black, M. J., Desbordes, G., Jin, J., Wang, Y., Alonso, J.
WorKim, S., Simeral, J., Jenkins, O., Donoghue, J., Black, M.
Wood, F., Goldwater, S., Black, M. J.
Sigal, L., Black, M. J. In scenes containing specular objects, the image motion observed by a moving camera may be an intermixed combination of optical flow resulting from diffuse reflectance (diffuse flow) and specular reflection (specular flow). Here, with few assumptions, we formalize the notion of specular flow, show how it relates to the 3D structure of the world, and develop an algorithm for estimating scene structure from 2D image motion. Unlike previous work on isolated specular highlights we use two image frames and estimate the semi-dense flow arising from the specular reflections of textured scenes. We parametrically model the image motion of a quadratic surface patch viewed from a moving camera. The flow is modeled as a probabilistic mixture of diffuse and specular components and the 3D shape is recovered using an Expectation-Maximization algorithm. Rather than treating specular reflections as noise to be removed or ignored, we show that the specular flow provides additional constraints on scene geometry that improve estimation of 3D structure when compared with reconstruction from diffuse flow alone. We demonstrate this for a set of synthetic and real sequences of mixed specular-diffuse objects. Balan, A., Black, M. J. 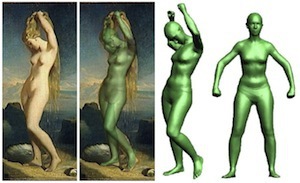 The detection and tracking of three-dimensional human body models has progressed rapidly but successful approaches typically rely on accurate foreground silhouettes obtained using background segmentation. There are many practical applications where such information is imprecise. 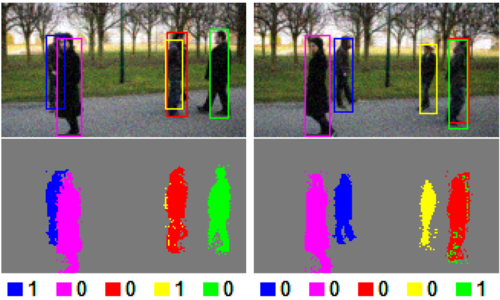 Here we develop a new image likelihood function based on the visual appearance of the subject being tracked. We propose a robust, adaptive, appearance model based on the Wandering-Stable-Lost framework extended to the case of articulated body parts. The method models appearance using a mixture model that includes an adaptive template, frame-to-frame matching and an outlier process. 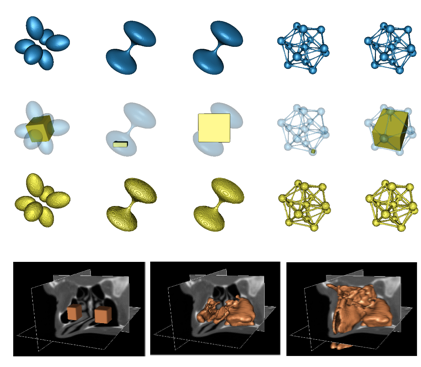 We employ an annealed particle filtering algorithm for inference and take advantage of the 3D body model to predict self occlusion and improve pose estimation accuracy. 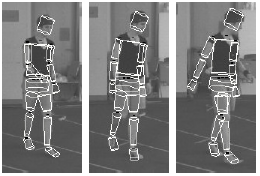 Quantitative tracking results are presented for a walking sequence with a 180 degree turn, captured with four synchronized and calibrated cameras and containing significant appearance changes and self-occlusion in each view. Kim, S., Wood, F., Fellows, M., Donoghue, J. P., Black, M. J.
Gehler, P. V., Holub, A. D., Welling, M.
Sigal, L., Zhu, Y., Comaniciu, D., Black, M. J.
Wu, W., Gao, Y., Bienenstock, E., Donoghue, J. P., Black, M. J. Effective neural motor prostheses require a method for decoding neural activity representing desired movement. 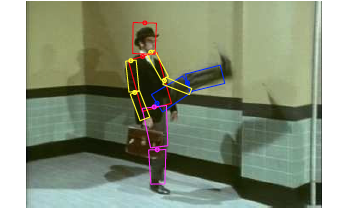 In particular, the accurate reconstruction of a continuous motion signal is necessary for the control of devices such as computer cursors, robots, or a patient's own paralyzed limbs. For such applications, we developed a real-time system that uses Bayesian inference techniques to estimate hand motion from the firing rates of multiple neurons. In this study, we used recordings that were previously made in the arm area of primary motor cortex in awake behaving monkeys using a chronically implanted multielectrode microarray. 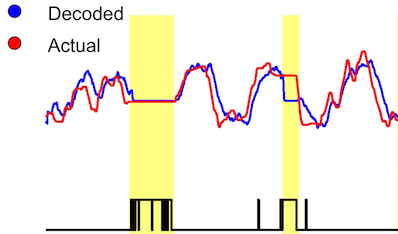 Bayesian inference involves computing the posterior probability of the hand motion conditioned on a sequence of observed firing rates; this is formulated in terms of the product of a likelihood and a prior. The likelihood term models the probability of firing rates given a particular hand motion. We found that a linear gaussian model could be used to approximate this likelihood and could be readily learned from a small amount of training data. The prior term defines a probabilistic model of hand kinematics and was also taken to be a linear gaussian model. Decoding was performed using a Kalman filter, which gives an efficient recursive method for Bayesian inference when the likelihood and prior are linear and gaussian. 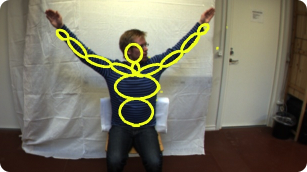 In off-line experiments, the Kalman filter reconstructions of hand trajectory were more accurate than previously reported results. The resulting decoding algorithm provides a principled probabilistic model of motor-cortical coding, decodes hand motion in real time, provides an estimate of uncertainty, and is straightforward to implement. Additionally the formulation unifies and extends previous models of neural coding while providing insights into the motor-cortical code.